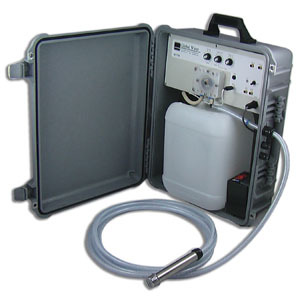 The WS 700 composite/discrete water samplers are easy to set up in the field. The composite/discrete water sampler's rugged rainproof enclosure can be padlocked and/or chained to prevent tampering. The composite/discrete water samplers are enclosed in a relatively small case that can be easily hidden or camouflaged to prevent vandalism. The composite/discrete water samplers are lightweight enough that even with a full sample bottle it can be suspended in a manhole for wastewater or stormwater sampling.